A Florida man who claimed to suffer severe burns when his Galaxy Note 7 exploded in his pocket is now suing Samsung. Jonathan Strobel of Boca Raton is the first to file a lawsuit against Samsung after the company officially recalled the latest addition to the Note series on Thursday. Strobel, 28, alleges that when the phone exploded in his pocket, it burned through his pants, causing severe burns on his right leg and on his left thumb, which he injured when he attempted to remove the phone from his pants. The lawsuit, filed in a Florida state court in Palm Beach County, “seeks unspecified damages for medical bills, lost wages, pain and suffering, and other alleged injuries,” according to Reuters. A Samsung spokeswoman said the company doesn’t comment on ongoing litigation. Strobel isn’t the only person who claims their Note 7 injured them. Earlier this week, the device exploded in the hands of a 6-year-old boy. Another Florida man claims his Note 7 was responsible for setting his Jeep ablaze. The exploding phone is also suspected to have caused a South Carolina house fire and nearly $1,400 worth of damage in a hotel room. 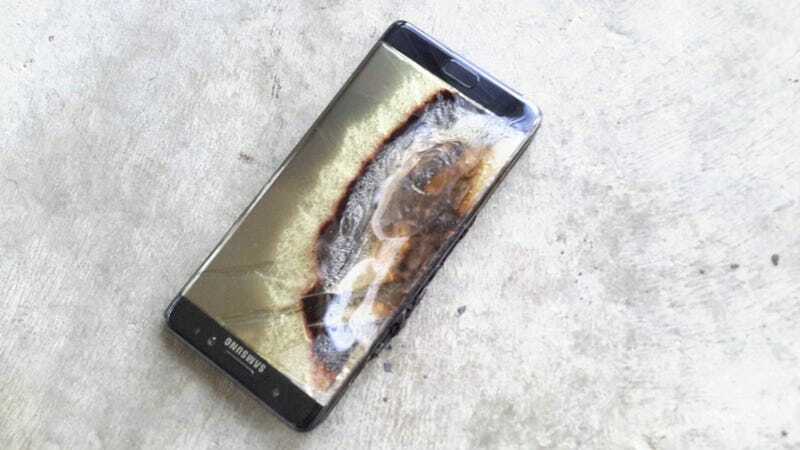 If you have a Galaxy Note 7, exchange it immediately. It’s clearly not safe and I don’t want you to get hurt.